This is the 100th #AdventBotany blog and the fourth for Christmas day. The first Christmas blog featured the Star of Bethlehem, the second, Christmas Cactus, and the third, a tough and Christmas flowering heather. This is the first Christmas blog to feature an edible plant. This blog is a brief introduction to the potato, how to roast them, their varieties, where they are grown and a little on their morphology. It’s 6am on Christmas morning and I’m just drinking my first cup of tea for the day – Twinings Darjeeling, loose leaf – and about the start on the food preparations: turkey with dry cure streaky bacon, pigs in blankets, plum and ginger stuffing, apricot and almond stuffing, parsnips, carrots, brussels sprouts, sugar snap peas, broccoli, and very importantly roast potatoes! My perfect roast potato has a floury texture with plenty of crispy surface to bite through, but I also like to keep the skins on, something not usually recommended as it restricts the access of the hot fat to the potato surface. I generally use Maris Piper potatoes but also like King Edward as a variety for roasting. 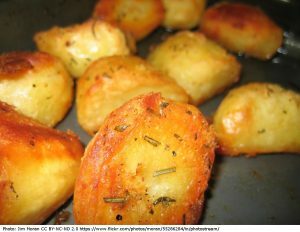 Generally potatoes with a fluffy, floury, texture provide the crispiest surface and softest middle. After boiling and draining the potatoes I let them cool then dust them in a mixture of finely chopped fresh rosemary and coarsely ground salt. Cooking with vegetable oil (rapeseed [= canola]) gives a light taste but you can use the turkey fat if you want a richer, heavier flavour. I like to roast the potatoes for at least 45 minutes but sometimes give them an hour at 180C (356F), usually turning them after 20 minutes to ensure all surfaces are well coated in fat. If you want to look at other approaches to roast potatoes you might start with the interesting comparison published by the Guardian in 2015. There is a well explained potato roasting video by Heston Blumenthal on You Tube that is worth a few minutes of watching time too. He peels his potatoes but then boils the skins with the potatoes for extra flavour (its the flavour that makes me just keep the skins on). How many potato varieties are there and what are those obscure numbers I see on supermarket bags? How many potato varieties is rather like asking how long is a piece of string. In the UK the Agriculture and Horticulture Development Board provide the Potato varieties database listing those registered in the UK – an astounding 5924 records! This can be a bit thin on data, which is not surprising given the number of varieties to deal with. The main varieties are usually described and illustrated, e.g. Maris Piper and the key features of pest and disease resistance/susceptibility given. If you want to choose varieties to grow or buy the potato variety guide at ‘lovepotatoes‘ is well worth reading. The website tag line is “Potatoes: more than a bit on the side” which perhaps conveys the user friendly and sometimes amusing approach of this informative site. 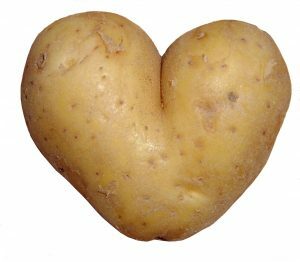 Looking around the rest of Europe a good starting place is the European Cultivated Potato Database which is both searchable and indexed. In North America you can check out the The Potato Association of America database. In any of these you have a good chance of tracking down those obscurely named varieties represented by a numeric or alphanumeric code. Of course potatoes originate in the Andes and it would be good to see a database of Andean potato varieties at some point! Potatoes are the fourth largest crop after Wheat, Rice and Maize and their cultivation reflects this. 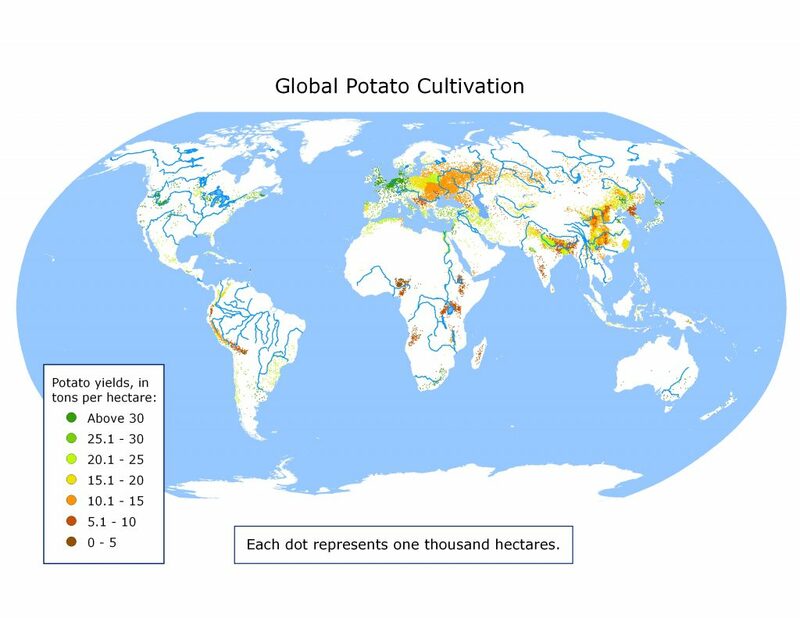 The fascinating World Potato Atlas provides a huge range of maps and data to guide you round areas of production, quantities etc. and is available in both English and Spanish. 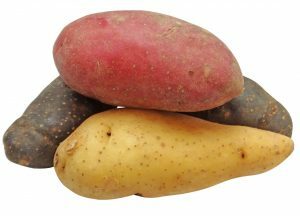 In the UK there has been an upsurge in cultivation of heritage potato varieties that can add new flavours and colours to potato based dishes. Carrol’s Heritage Potatoes is one supplier of such varieties. It includes the beautiful Red Emmalie and deep purple Violetta. This blog was not aimed at repeating the widely available information on the 8000 year history of the potato which is well recorded elsewhere and you might read the Smithsonian’s ‘How the potato changed the world’ to get an insight into the consequences of that history. This short summary is aimed at guiding you to some of the excellent potato resources available. I want to close the blog with a basic description of the potato tuber. It is a stem tuber, unlike sweet potatoes which are roots, and it reveals it’s stemmy nature but having axillary buds (known as eyes) and a terminal bud (known as the rose). This entry was posted in Advent, Herbarium RNG, Public Engagement with Science. Bookmark the permalink.